Last time I got to walk with Matthew (@hillplodder), was in the Lake District. 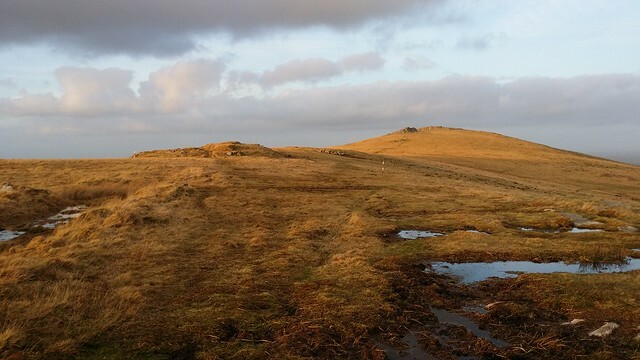 I was still suffering from this bloody chest infection, and we only managed a short wander up Latrigg, so I was really looking forward to meeting up with him for a few days walking on Dartmoor. Sadly, I would only manage the one tor bagging session in his company but it was a good one! 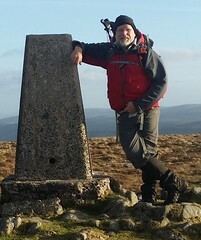 I had just had two relatively quiet days resting up my aching chest / back at Halwill Junction base camp. Jim had left on New Years Day and I was just hoping to be fit enough in time for Matthew's arrival on the second. I got a text from Matthew about eleven that morning to say he had made good time from Essex, and I made my way to meet him at Belstone Services, feeling I was up for the next three days. With his arrival being an hour earlier than expected, it was possible to lengthen our walk today. We drove to the Belstone car park and set off at about a quarter past midday for, what turned out to be, a five hour walk. Usually, when walking from here, I would either head straight through the village up to the moor gate at Watchet Hill, or drop down into Belstone Cleave, but this time we turned right down a lane towards Old Rectory Farm, and took a footpath left out onto moorland high above the East Okement River, known as West Cleave. 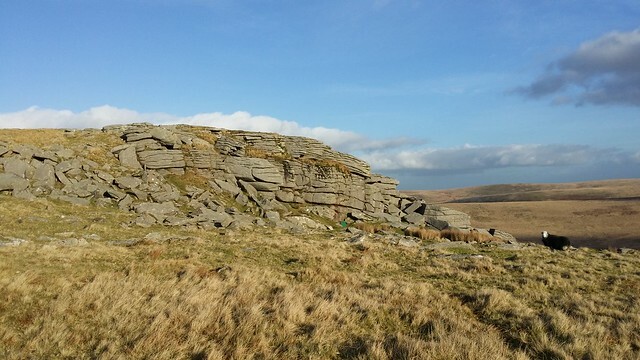 Cleave Tor is our first stop, turning to the right. 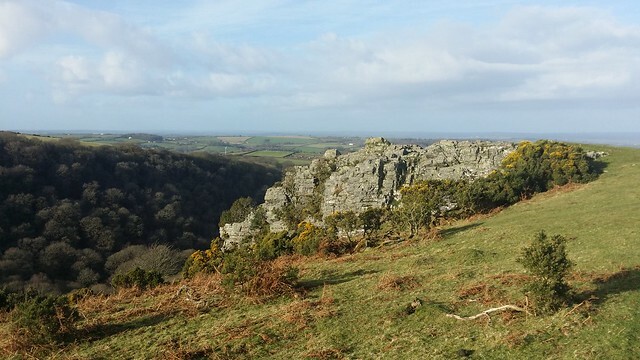 It's a fine outcrop lording it over the valley, with views of Okehampton to the north, East Hill to the west, and the East Okement valley and high moor to the south. We started south, along the rim of the valley, some good ground, some soggy. 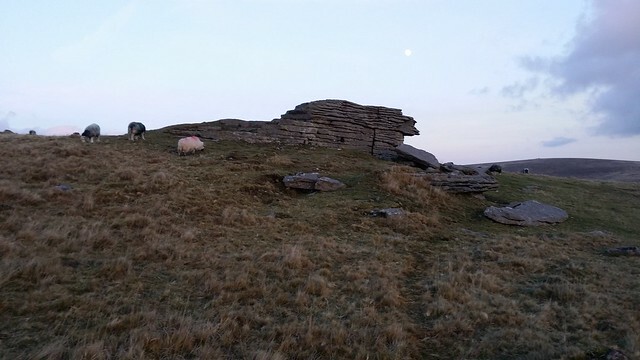 Scarey Tor is far from it, not sure where the origins of its name come from. The approach from the north doesn't impress, but the view from the south it is more "tor-like". 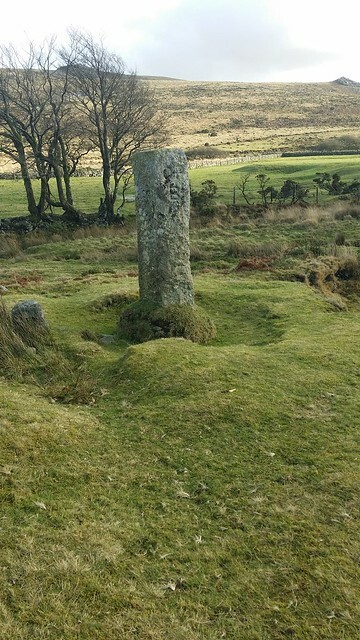 We dropped down to the ford at the East Okement, where a hefty stone inscribed "OPB" marks the Okehampton Parish Boundary. This location is also a point on the forest boundary perambulation of 1240. 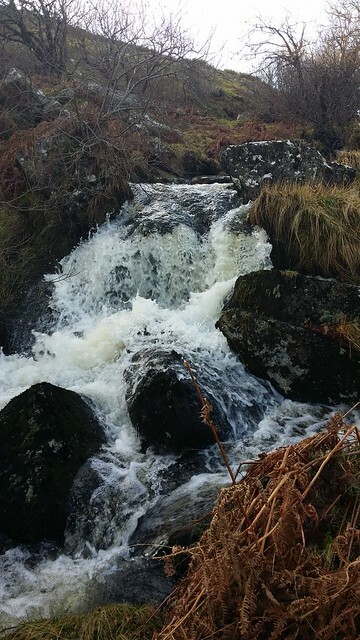 We strayed from the path that takes us to Okehampton Common, walking closer to admire the rushing water cascading down the Black-a-ven Brook at a place called Cullever Steps. With heavy rain the day before, the run off made for quite a spectacle. 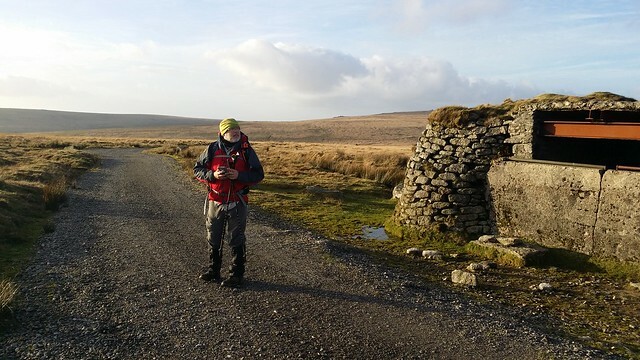 Above the steps, we reached one of the military roads, which we took across the Black-a-ven Brook, following the Okement Farm boundary wall to its South-East corner. 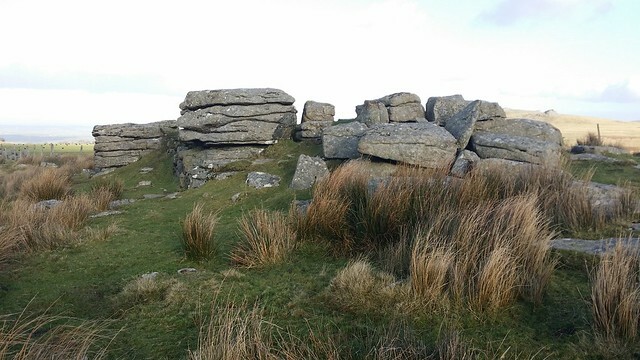 Here, we found, Hart Tor (Okehampton Common). 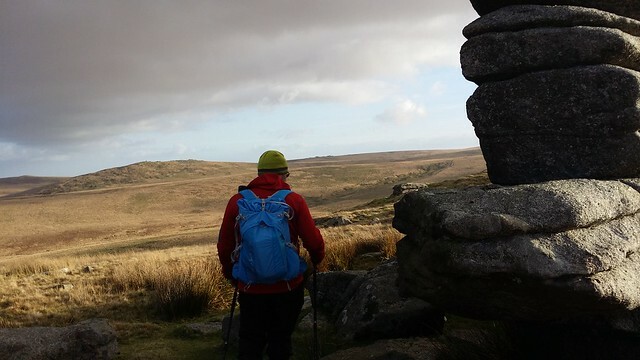 We carried on down the road for a little further, but soon it was time to leave the tarmac for the moor, and a meandering climb up to East Mill Tor. 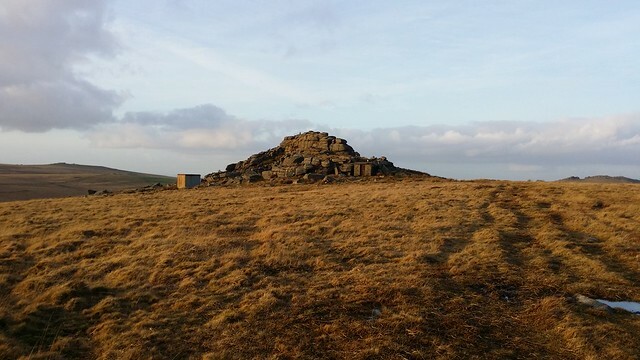 I've never visited it before, more enticed by the likes of Yes Tor and High Willhays one side and Oke Tor the other. This does the tor a disservice. Ascending, we reached a lower outcrop, worthy of its own name. We carried on up, being greeted by another section. This one is more substantial the lower. We stopped briefly, whilst I took a half of my sandwich; I wasn't making the same mistake, this time, as I did on the South-West Coast Path three days earlier. 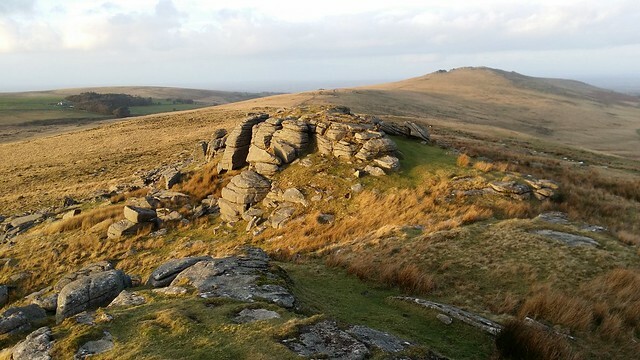 Thinking we had seen the larger outcrop, we came down the southern edge, where a third outcrop of East Mill Tor appeared; it is far more formidable from this side. Here, we checked the time. 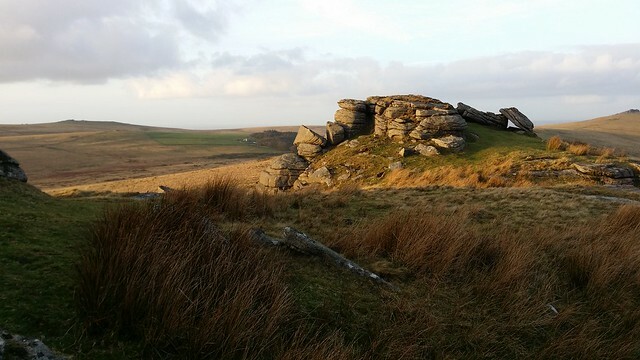 It was only 2:30pm, and we considered turning east to scale Oke Tor, and possibly Steeperton. But I spotted the military road running south, then south-east, up to Okement Hill, and knowing that my bagging tally was suffering on this walk, I wanted to attain it. So, we went for it. It was easy walking up onto the hill, along the track. There is little to see in the way of features here, except for a military bunker. Now it was time to turn back, continuing on road, in the direction of Steeperton Tor. 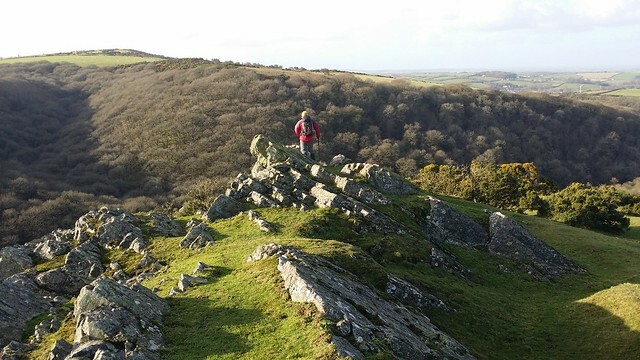 Matthew still fancied the idea of tackling Steeperton, but he soon realised that as you leave the road and drop down to a rough track, you see Steeperton Gorge, and it dawns on you that it will take time to reach the summit; time we did not have. The rough track can be followed south all the way to Hangingstone Hill, but we were taking it north, as far as Winter Tor. This track is always rutted and a bit of a meander avoiding the black peat puddles. At one point, I jumped a particularly boggy section, and felt the pain in my back return. 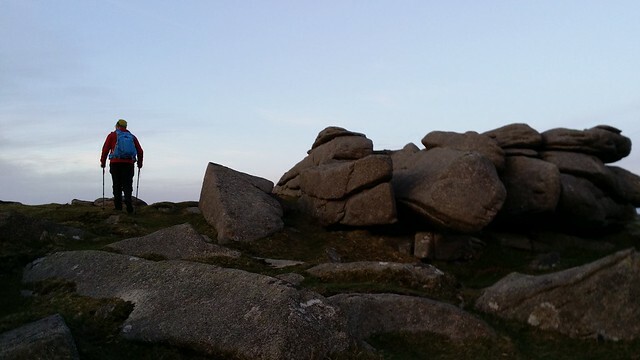 We came to the fine Oke Tor. This is one of my favourites. 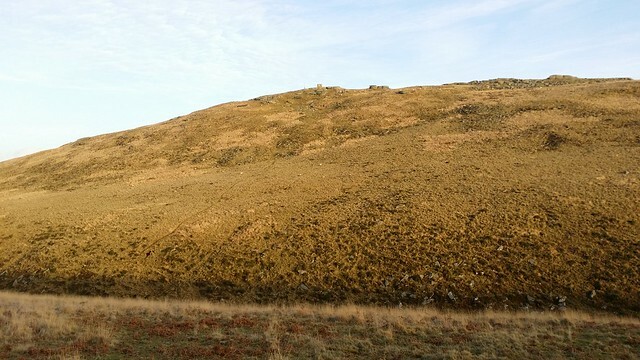 The idea of wild camping here has always appealed, but, in the past, closer inspection found a prolific amount of cow, sheep and pony dung. 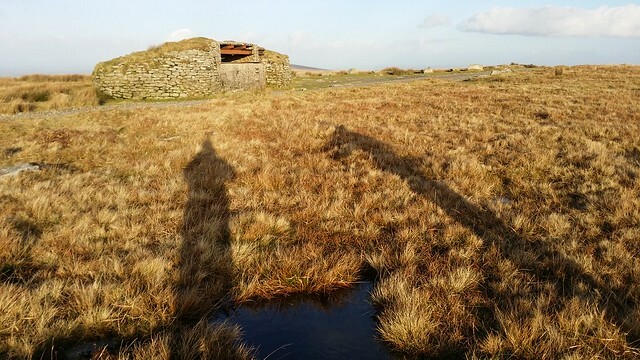 It's a testament to the quality of shelter afforded by this tor, but this time, it was relatively clean; time will tell if it will be in the same state if I return later in the year to camp. 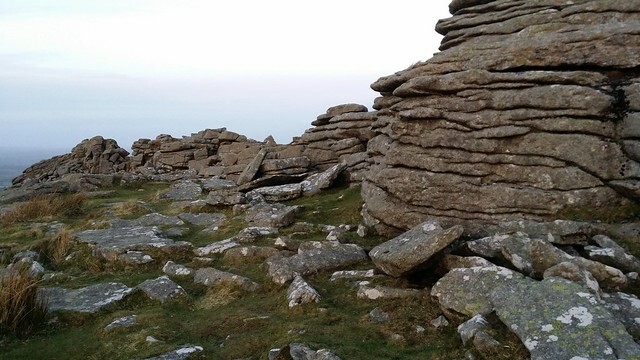 We walked along the top of the main part of the tor as far as able, then scaled the second main outcrop. It was all good fun. After such a wonderful tor, Knattaborough is something of a disappointment. 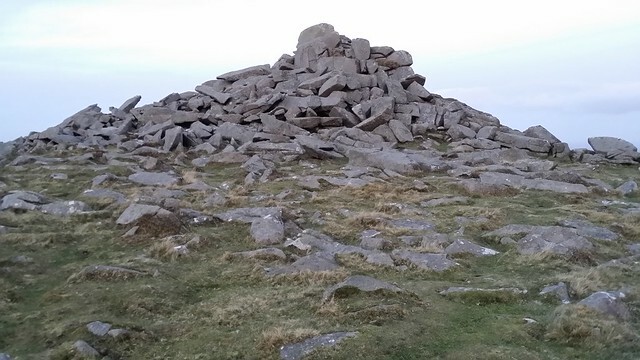 I have stepped over this tiny tumulus countless times, but if it weren't for Ken Ringwood, I would not have even realised it was a named tor. Of course, it ticks the box as it falls into the "either a high rock or pile of rocks on the side or top of a hill" definition. 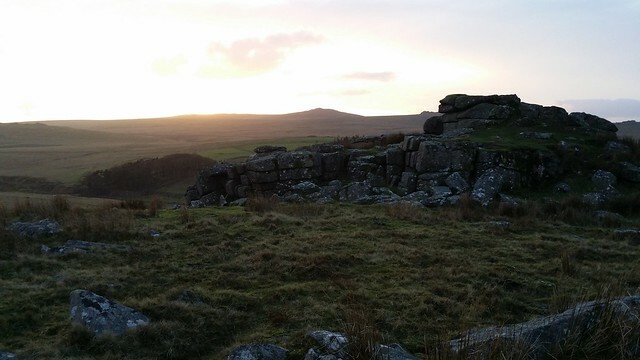 The sun was dropping behind High Willhays when we reached Winter Tor. We couldn't linger, as we still had the Belstone ridge to tackle. 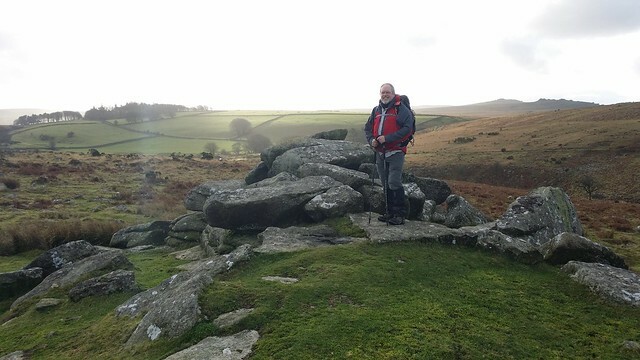 Up we went, first to Lower Tor, rounding it, bagging it, to begin our ascent to the aptly named Higher Tor. Higher Tor is a great wall, surrounded by plenty of clitter. 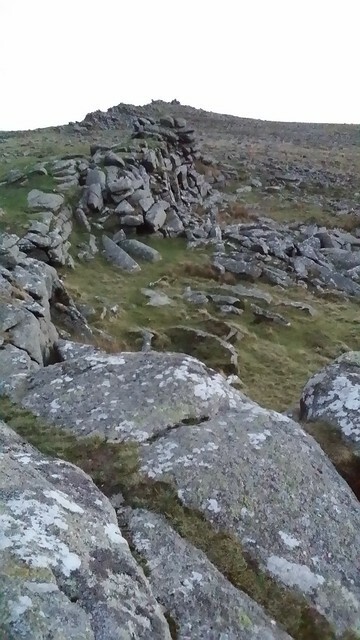 We had time to climb up over the tor. Thinking it was a one way route, I left my poles at the bottom, only to find it was a relatively straight forward walk off the outcrop. I had to return to retrieve them and, in doing so, felt my back tighten further again. I was starting to feel it, now. 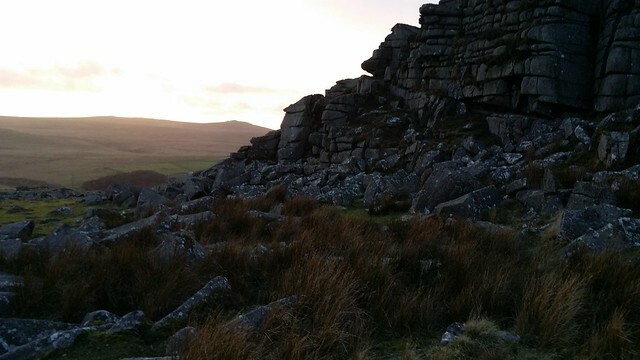 Through Irishman's Wall, we moved onto Belstone Tor and the common. 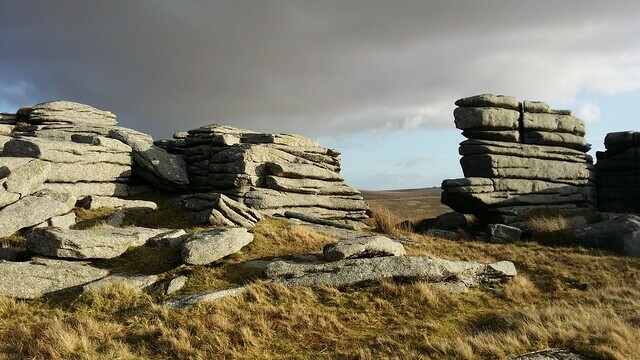 Over the first outcrop at Belstone Tor, you face another. There is a vague path through all the clitter to reach it. Like the three on East Mill, this part of the tor has been lumped with its neighbour; it deserves a name, but we couldn't come up with one. Up onto its top, we could see the finish line. We descended to the final bag, Tors End, and then picked our way through the remaining clitter. We reached a clear path that went over Watchet Hill, dropping down to the track that leads to the moor gate. In near darkness, it was, for me, a painful walk through the village, back to the car park. We were there by ten past five, a worthy day's walking in the space of an afternoon. But at a cost. The drop in temperature accentuated my back pain and it made for an extremely uncomfortable drive back to base camp. Hopeful that, like the other occasions this week, I would recover by the next morning, we went to the pub. Over dinner, we made route plans for the next two days. Perhaps the few pints acted as an anaesthesia, but by the morning, it was clear there was no way I was going to join Matthew for the rest of the weekend. A great shame, Matthew is always good company to keep. 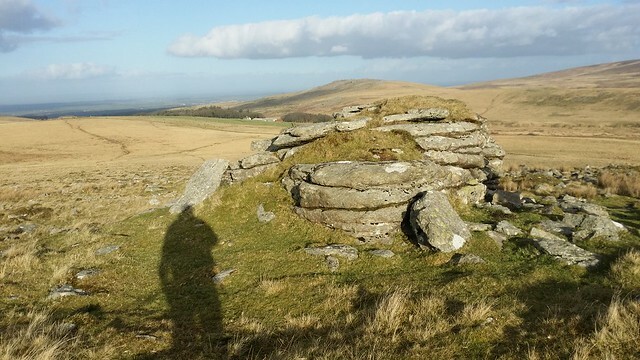 I'm sure we'll have many more chances to walk Dartmoor in the future. As he left on his own adventure for the next few days, I was resigned to watching his tor bagging on Social Hiking for the remainder.